Handmade gifts are perfect for anniversaries – they’re one of a kind and special, just like the love of your life. Making your own handmade gift is a wonderful option, but buying a personalized gift from a handmade seller can also provide that unique touch. The first few anniversaries are very special – when the love is starting to get comfortable and your lives have begun to weave together. During these years more than ever, you want to find the perfect gift to celebrate the love you share. For each year of marriage, there’s a material that goes along with the year when choosing an anniversary gift. It can be tough to find a creative gift while sticking to the traditional materials. Here are some creative handmade ideas for the first five years of anniversaries. The scrapbooking craze in the handmade world has given a big boost to papercraft. In fact, scrapbooks of the adventures shared during the first year are a great gift. Tickets to a game or concert that your spouse would enjoy can be a thoughtful way to share another adventure together. 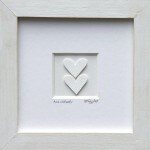 Framed paper art is another option for the first anniversary that could be displayed in your home for years to come. The Anniversary Hearts from Simon’s Gallery are made from watercolor paper and can be personalized with a date or other message in the title area of the artwork. For a very personal piece of framed art, use your own wedding announcement along with a wedding photo in a double frame. Many places online will even etch a glass or metal frame with the text from your wedding announcement for an even more customized option. 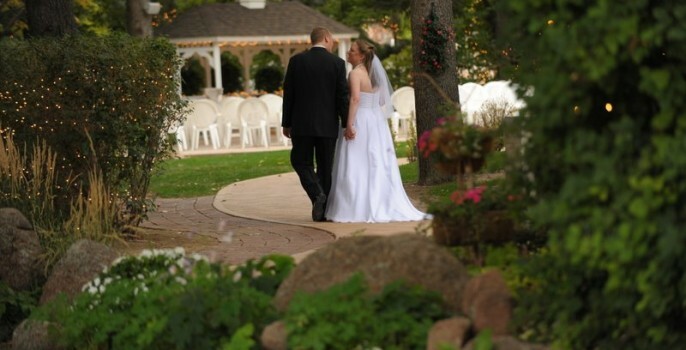 For my first anniversary, I filled a heart-shaped box with rolled-up love notes and memories for my husband to read. The notes could also have lyrics from wedding songs, inside jokes or coupons for household chores that your spouse can use. Special note: paper is traditional for the first anniversary in the U.S. – for couples in the U.K., the order of the first and second year is switched (cotton, then paper). The cotton industry will be the first to tell you that there’s a great deal of things made with cotton – really, they have a site about it called Surprise, it’s Cotton! Clothing is the most common – especially clothing for a little one on the way, if your anniversary is timed nicely with a pregnancy. Artwork done on a cotton canvas is a nice twist on cotton gifts. 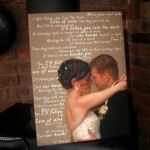 Gee Zees offers a Custom Art Canvas with a photo and text that you supply. The text could be wedding vows, poetry or prose that you wrote, or a collection of memories and funny stories. A sachet with your lover’s favorite scent is a great cotton gift that’s easy to make by hand. These scented bags can be placed in suitcases, closets, amidst shoe racks or in cupboards to sweeten up the joint. Personalized towels or a family pillow might be a little cheesy, but that’s just what the doctor ordered for corny couples. Leather can be both naughty and nice. Leather-bound books, journals and photo albums are a nice gift for the third anniversary. There are plenty of leather accessories that can be personalized, from keychains and bracelets to guitar straps and wallets. 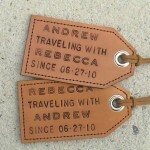 These personalized leather luggage tags from Leather Made Nice are my favorite – they’re just adorable. Leather gardening gloves can be a practical gift for the green thumb in your relationship. For the craft-inclined, leather kits are available from many craft stores to make your own belts, wallets and other leather items. The fourth anniversary is celebrated with linen or silk here in the U.S., but our friends across the pond use fruit and flowers to commemorate the fourth year. Besides the first two materials being swapped, this is the only year that differs significantly between the U.S. and U.K.
A silk bathrobe, blouse or tie is a traditional choice for this delicate anniversary. Nice quality linen bedding is both practical and fun to try out. 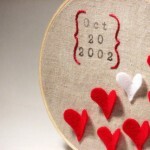 For a sentimental option, personalized linen wall art, like this embroidery hoop from A.E. Wilder, can make a statement in a special room of the house. Hand-painted or stitched linen napkins with a family monogram are another idea. If your spouse is of British descent or fruit and flowers just sounds more up your alley, there are plenty of handmade options as well. 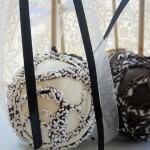 The Atomic Apple offers gourmet chocolate apples that are sure to be a hit. Chocolate-dipped strawberries are another favorite that can be made with just a few ingredients at home. The Little Ragamuffin offers organic flower seeds on Etsy. Kusudama origami flowers are another lovely surprise that could be used for either the first or fourth anniversary. Flowers picked from the garden or a favorite location can be preserved by drying or pressing for a surprising – and long lasting – anniversary gift. The final year in our tour de handmade, year five is a landmark of solidarity. A custom, handmade wood furniture piece is a great option for fifth anniversaries – it can be a practical, daily reminder of your marriage. There is no shortage of talented furniture artisans both online and locally. 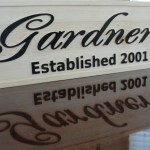 A wood sign, like the family name sign from Michael’s Wood Works, can be a fun gift to personalize your home. Wooden roses made from wood shavings are both stylish and easy to personalize with someone’s favorite color. Wood is used in jewelry boxes, picture frames, earrings and even wooden beads. The sky’s the limit on this anniversary. Handmade gifts show the recipient that you’ve put not only thought, but time and effort into the perfect gift. This year, let your spouse know how unique and special they are to you with a handmade gift that’s unique, personalized and made just for them.